Set in Colorado, a former army officer leads a group of Army prisoners trying to recover two sisters who were captured by the Cheyenne five years earlier. When they finally get them one doesn't want to go back because she is going to marry the chief, and the other doesn't want to face the scorn of white society for living the life she had to live. The movie is famous for a couple of reasons. One is that it was filmed in 3D, and you see quite a few objects being thrown or shot at the audience. The other reason the film is famous is because it is the movie credited with originating the "Wilhelm scream", a sound effect used in the Star Wars film series, as well as countless other movies including the Indiana Jones franchise, Disney cartoons and The Lord of the Rings film series. In the movie private Wilhelm stops to get some tobacco, and gets shot in the leg and lets out a scream. The scream originated in a 1951 movie, Distant Drums, when a man is bitten by an alligator. But later a sound engineer labelled it as "The Wilhelm Scream" and it has been referred to that ever since. Lots of battle scenes with tomahawks, spears and arrows flying across the screen and plenty of Indians being shot off their horses. Unfortunately, one of the most blatant cases of Indians being used just as a menace, with no insight into what they were thinking. It was also pretty unrealistic to have the girl, who had been a captive for over five years, talk like she was just off the streets of New York. Also it was a little crazy watching Sgt Baker spitting tobacco at a rattlesnake twice, to take advantage of the 3D effects. As to be expected the lead scout, Miles Archer squares off with the Indian chief, kills him and then rides off in to the sunset with the older of the captured sisters. 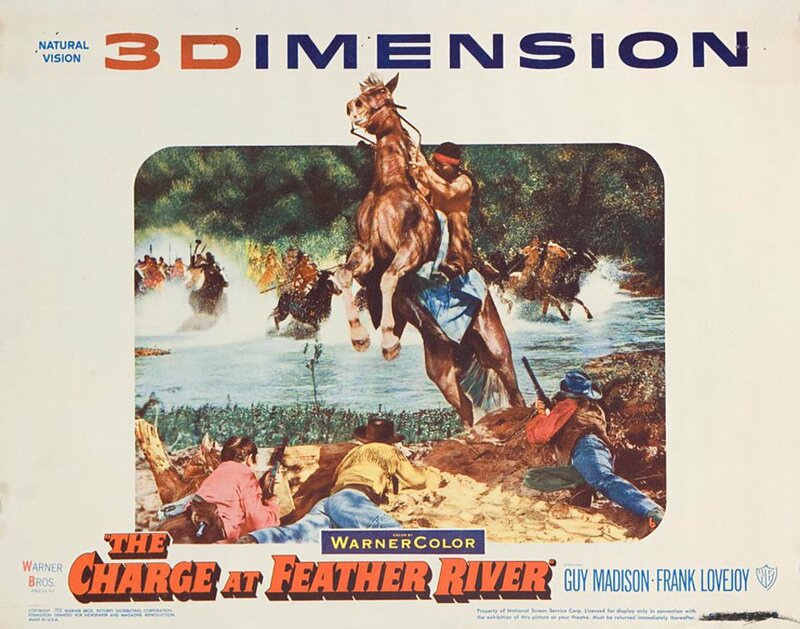 Sort of interesting as a sub-genre of prisoners in serving in the army, Indian captive movies, 3D movies and of course one of the originators of the Wilhelm scream. But, overall the movie was just OK.